Thank you for stopping by my shop! 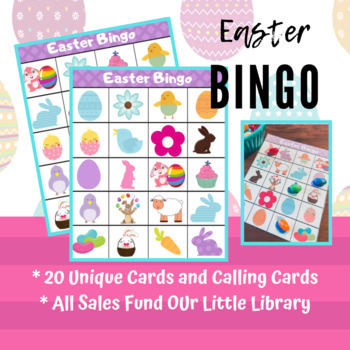 This listing is a cute Easter Bingo Game perfect for Easter brunch or party AND if you print the calling cards off twice... you will also have a memory game too! So, that's 2 for the price of 1... awesome deal! 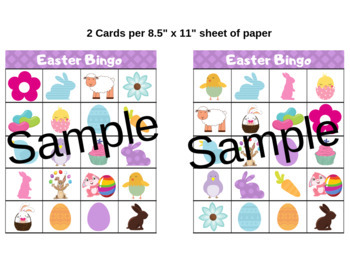 Cards read Easter Bingo, but the banner can be cut off if you should want "Easter" removed. ****NOTE- I didn't include any place holders because I knew you wouldn't want to cut 10,000 of them out... so instead use marshmallows or jelly beans as place holders. For longer use, laminate the cards and calling cards. Have fun and Happy Easter! The proceeds from this sale go to help fun our Little Library! For more information check out my blog at www.BlueEyedMama.com.